McDonald’s has been urged to take more responsibility in response to an increase in the amount of litter washing up on Leven beach. The new drive-thru restaurant opened its doors in January, however, there have been complaints about the amount of McDonald’s packing that has been found along the Promenade since then. The new McDonald's in Leven opened in January. A beach clean held shortly after the restaurant opened found a “shocking” amount of packaging, according to one of the organisers, Charlie Guy. 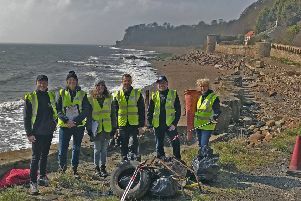 Around 20 people took part in the beach clean, finding 450 litres of litter strewn across the beach – including plastic bottles, oil containers and even trolleys. There are now plans to hold another beach clean on June 8. Meanwhile, Councillor Graham Ritchie has called for McDonald’s to take action. He said McDonald’s carried a “large portion of responsibility” for the litter situation. “I commend the volunteers who have been carrying out beach cleans, but this is a job no one should have to do,” he added. “McDonald’s needs to review its environmental responsibility in Leven. Things it could consider include arranging and helping to pay for waste collections, recycling and responsible disposal, designing products for re-use or recyclability, and encouraging customers to correctly dispose of their products. A McDonald’s spokesperson said it was “committed” to reducing its environmental impact – highlighting that it is moving to paper straws, 80 per cent of its packaging is recyclable and that it aims for all of its guest packing to come from renewable, recycled or certified sources by 2025. If you are interested in taking part in the beach clean in June 8, email fifevolunteers@gmail.com.